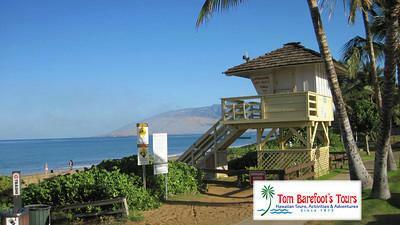 What could generally be considered the first of the truly beautiful South Maui Beaches as you work your way south from North Kihei is Kamaole Beach Park #1 which is the first of the triad of beaches known as Kamaole Beach Parks #1,#2 and #3. This is the part of the southern coastline of Maui that starts to have the exotic and beautiful white sand beaches that Kihei and further south Wailea and Makena are famous for. Kamaole 1 is a beautiful white sand crescent that stretches one-third of a mile from one point to the other. Snorkeling is really only good here at the points of the beach but the white sand bottom in the middle makes an ideal place to swim. As is the case with most South Maui Beaches, Kamaole Beach 1 is usually flat and beautiful in the morning hours and as the late morning and early afternoon approaches the beach will be filled-in with the trade winds and the ocean here will become wind-whipped and choppy. Your quality of beach time will generally provide a similar experience as the earlier morning will be ideal for lying out and enjoying the sun while the wind may provide an irritating experience in the afternoon. Kamaole Beach 1 is an oddity in that it is actually two beaches in one. 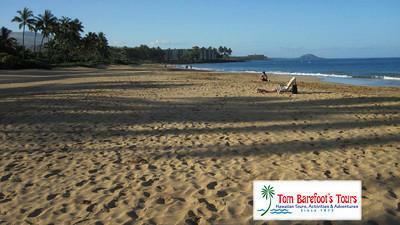 The full crescent of the beach from tip to tip is referred to as Kamaole 1 but the very far point of the beach and the sands that compose it are also referred to as Charley Young Beach which has its own separate access from the road. Regardless of what you call it; Kamaole 1 Beach is one of the best beaches on the island particularly if you enjoy swimming. Each morning you will find a number of people jumping in at one side and swimming the distance both down and back which makes a very invigorating two-thirds of a mile swim. This can be done at any time of day but unless you want to fight the wind-chop your best bet is in the morning hours and the earlier the better. As far as amenities Kamaole 1 has a parking lot as well as parking available along Kihei Rd and in a dirt parking lot on the other side of the street. There is a restroom and showers and picnic tables and some barbecue stations. There is quite often a volley ball net set up in a sandy portion of the park area and there is also a lifeguard station.